Nicolas Vérin has many influences, from jazz to electronics, from American to French music, give him an unusual style, apart from the main trends of French contemporary music, combining energy and subtleness. 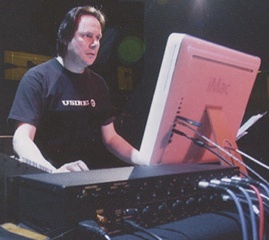 While rooted in electroacoustic music and its approach based on composing with sounds rather than notes, he also wrote many instrumental pieces and specialized particularly in music mixing live performers and electronics, whether fixed sound or live processing. At the basis of his work are the musical gesture and the life of sound and its morphology. An improviser himself, his works often leave a creative space for performers, and he has collaborated on many occasions with famous improvisers. Nicolas Vérin received commissions from the French Ministry of Culture, Radio France, INA-GRM, Studios, Festivals and Conservatories. He was composer in residence in the Midi-Pyrénées region and was awarded the prize Villa Médicis hors les murs. His music, published byÉditions Jobert and Éditions François Dhalmann, has been performed and broadcast worldwide.